5 Characters with Character | Shafer...Power! I’ve talked a lot recently about our goals for Shafer…Power!, however, I haven’t spent much time discussing how we’re going to accomplish them. Therefore, I’d like to dedicate this post to what I feel are the most important traits of entrepreneurs who are working to change the world…and how the kids and I will try to leverage some of these traits to accomplish our goals. 1. 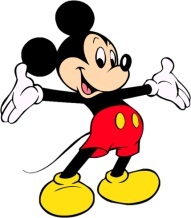 Vision: Mickey Mouse, originally known as Mortimer Mouse, is the brainchild of Walt Disney. Disney, of course, was one of the great all-time entrepreneurs. Even though he did not live to see the opening of Disney World, Walt had such a strong vision that others were able to finish his dream. 2. Passion: It’s important to feel strongly about something because there will be a lot of obstacles and roadblocks along the way. 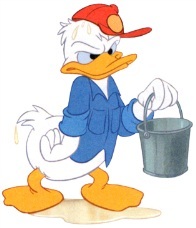 And have you ever met anyone more passionate than Donald Duck? 3. Perseverance: Let’s be honest, I thought it was over for Woody when Buzz Lightyear arrived on the scene. To Woody’s credit, however, he was always there for Andy and even partnered with Buzz to defend the toys from the evil boy named Sid. 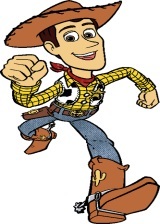 In fact, it was Woody’s perseverance that landed him a role in Toy Story 2 and Toy Story 3. Nice job Woody! 4. 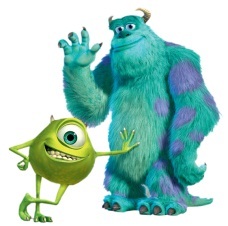 Courage: There’s a lot of scary stuff out there and James P. “Sulley” Sullivan can definitely tell you about it – after all, it’s his job. But if you have enough courage to pull back the covers, things may not be quite as bad as they first appear. In fact, they’re probably much, much better. 5. Swiftness: If I left Lightning McQueen out of this lesson, my story would fall on deaf ears. Lightning is cool and my kids love him because he has a great heart and he’s really, really fast. Ka-chow! Who are some other characters with character? Kids’ll love it. What about Goofy? How well did the kids respond to your characteristics, they agree all characteristics to be important or did they just agree with what you said? Did they understand all of the analogies? Good questions Nick. They understood the Disney characters immediately and most of the concepts as well. Vision and passion may take some time and will give us something to work on. Thanks for the kind words. Never thought about Donald Duck that way — now, he’s the man! Thanks Jeff for checking in…I couldn’t agree with you more! Thank you John. Is there any chance his Ted talk can be found online…perhaps on YouTube? Ka-chow! We love Lightning too. And to his credit, he always remembers the importance of friendship (versus winning in the end). Most of the entrepreneurs I admire also “play fair.” They give back, treat employees and customers well, etc.